It appears some HOA boards hold your feet to the fire and stand in the corner with a can of gasoline. Does that sound familiar? You do everything you think you should be doing to manage a beautiful property yet the board believes you are making the wrong recommendations about what to spend what precious little resources you have, mainly money. A lot of my travel focuses on showing feedback software to groups of resort managers through the RCI Lunch and Learn program, the VRI Preferred Vendor Program and the Timeshare Board Members Association (TBMA), management company leadership conferences and, of course ARDA. My preference is to educate rather than “pitch” and over time I have learned it is possible that resort management professionals might take more for granted than they should. At every opportunity, I ask the question, “who in this room is familiar with the RCI Comment Card system and reports”? Almost every hand goes up, and the Interval International resorts are familiar with their II survey results as well. And, what I talk about without doing a commercial is the need to measure before you can manage. And, you should engage your owners and guests at the same time. That goes for all the management of the property, including the HOA board. RCI was the very early adopter- over 30 years of capturing and reporting data. And, roughly 15 years ago they moved to an online system that deploys several million surveys to their members that have exchanged into an affiliated resort. The importance of this effort cannot be underestimated. It is a differentiator for resort managers and HOA boards in understanding the sentiment of the exchange guest. And many management companies believe providing for survey deployment is a wise investment to help them, resort managers and their HOA boards prioritize how they spend maintenance fees. Among other important benefits for management companies when they engage their guests is the increased income from the rental programs. A key to this initiative is the speed in which you, the resort manager, responds to the issues. The faster the response, the greater the guest loyalty, assuming, of course, you have let them know you fixed what they reported – that is called engagement. In the world of guest feedback, the best reports are available 24/7 and contain actionable data that your board members have access to. 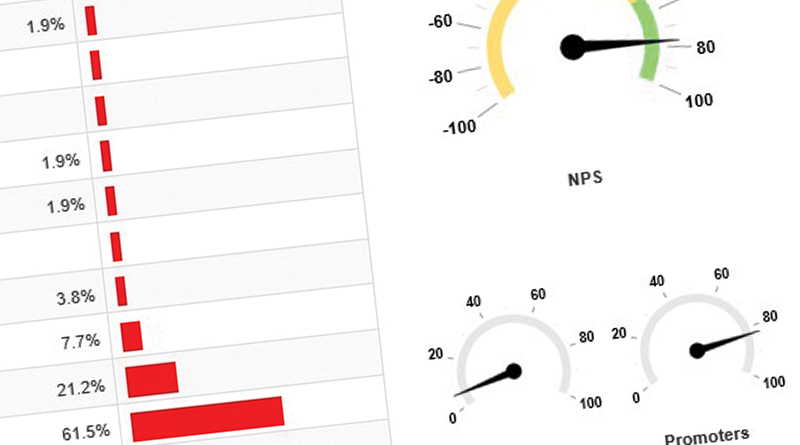 Average scores and verbatim comment reports are common and valuable as is the all-important NPS report. The report above is an example of an Average score report and demonstrates the scores on several attributes. Based on a 7 point Likert scale (https://simplypsychology.org/likert-scale.html) it demonstrates general feelings about the most important attributes. Couple the report above with the NPS Report on the left, and the board will see just how strong your promotors are. And, as mentioned, therefore a good gauge of your owner and guest loyalty. Another significant report that follows the NPS report is the verbatim report. The Verbatim Comment report below has several valuable consequences, including finding out the “why” of certain scores. In this case, the NPS questions are addressed. What’s up with this Social Media thing? Recognizing there is a significant difference between quantifying guest sentiment using structured data and qualitative data using unstructured data is one reason that certain rating sites prefer the use of survey instruments to distribute their sites. While I won’t dwell on the social media monitoring in this article, I can tell you that using the survey mechanism as a way in increasing your reviews, your social media reviews will increase. Meaning that you and your board need to pay very close attention to them. And relying solely on them without a regular analysis of your survey results as a comparison can only lead to one result. Nothing changes. Not good, not bad, just even. Worse, relying solely on social media monitoring exclusively for your public relations efforts runs the risk of providing incorrect information to your board, whether you like it or not.